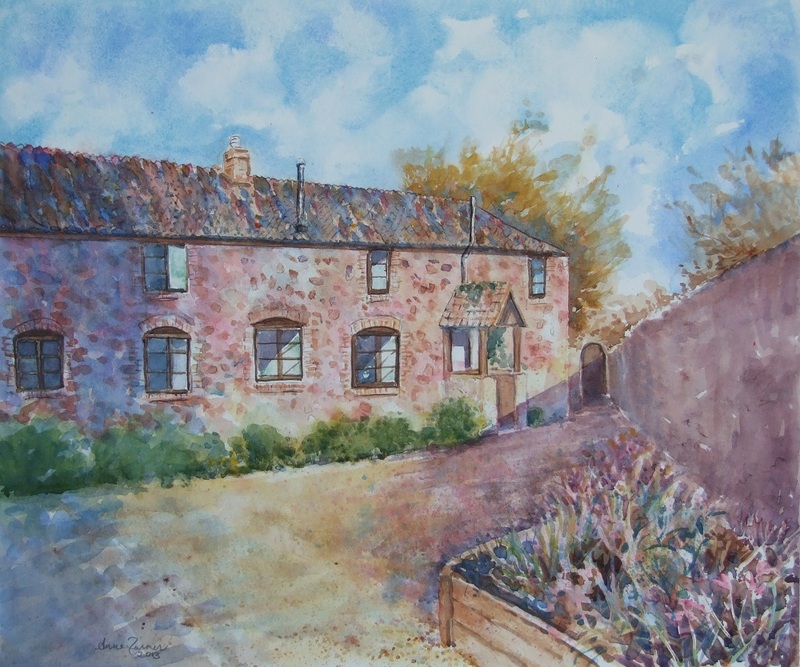 Having parted company with Chelsea, I next turned my attention to another commission: a lovely old converted building in Spaxton, on the Quantocks, sketched and photographed on a gorgoeus bright Autumn morning. The Challenge here was that the building was quite long, but with a fairly close wall, so a distant view wasn’t an option. So I picked a spot where my customer often sat, looking over to the other end of the building. The sun streamed in at the windows, but a large tree conveniently provided a shadow on the left which stopped the eye, instead of feeling the building was cut off on that side. Well, that’s the theory anyway. The typical Quantock red stone gave a rosy glow and enabled the use of some lovely purple shadows. The stony gravel was fun too – lots of splattering! This entry was posted in Uncategorized and tagged art, commission, painting, Quantocks, watercolour by anne farmer. Bookmark the permalink.